In 1839 Tonbridge was said to be notable for just two products, Tunbridge Ware and gunpowder. For obvious reasons, the latter was not manufactured close to the town, but a mile upstream at Ramhurst on the boundary between Tonbridge and Leigh. The venture's Tonbridge initiators included John and John George Children of Ferox Hall and James and William Burton of Mabledon. The chemist Humphry Davy was also involved in the early stages. Gunpowder manufacture involves grinding the ingredients to a very fine powder and thoroughly mixing ('incorporating') them. This was done by heavy stone rollers known as 'edge-runners', driven by water power. The map shows how power was obtained at Ramhurst. 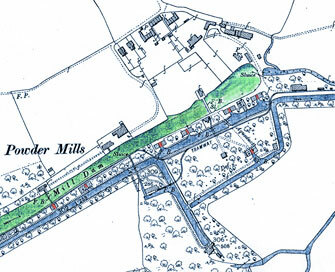 Water extracted from the Medway upstream was led into the 'Mill Dam' (shown in green), and fed to a number of breast-shot waterwheels (visible in red on the larger version of the map). After a drop of ten feet, tail water (shown in blue) ran out to rejoin the Medway further downstream. The low level waterways were also used for transporting materials around the site by barge and for carrying the finished product out to the Medway. Material could also be moved around the site in wagons running on a narrow-gauge track and pushed by hand. Edge-runner stones remain on the site. 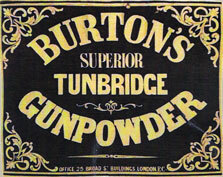 Production began in 1813, and it is possible that Tonbridge gunpowder was used at the Battle of Waterloo. By mid-century the expanding Tunbridge Gunpowder Works was producing 300-600 tons of powder a year, all shipped by barge down the Medway to the Thames. When military demand slackened, production was turned to powder for sporting use. William Burton was in sole charge and ran the firm successfully until his death in 1856. It subsequently became part of Curtis and Harvey and ICI. Production ceased in 1934, when all buildings involved in the production of gunpowder were razed to the ground for safety reasons, though the manager's house and workers' cottages still stand. The Powder Mills site is private and not accessible to the public, but part of it has recently been thoroughly cleared and recorded by volunteers under the auspices of Leigh Historical Society. Further information is on the Society's website and in the book 'The Lost Powder Mills of Leigh' by Chris Rowley (2009, ISBN 978 09539340 1 0). Panoramic views of the cleared Powder Mills site are available on the web here (May not work on some computers).